STATE OF THE ART: The company's Kingston headquarters. Below: Sinclair. As it prepares to mark its one-year anniversary, local animation company Reel Rock GSW Animation has secured a lucrative agreement with the French-based Studio Red Frog, an animation production company that bills itself the “Digital Storytellers.” It’s a seriously groundbreaking agreement that calls for the production of 13 episodes of Quiz Time, a cartoon targeting children in the 2-6 age group, which airs on Disney Junior in France. Turns out the contract is the first of its kind for a Caribbean-based animation studio to provide production work for a series airing on a major international TV network. “This is an amazing achievement for us, considering that we are still less than one year old,” says Wayne Sinclair, Executive Director of Reel Rock GSW Animation. 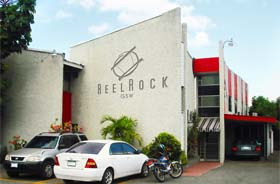 “It is a testament to the very hard work put in by our dedicated and super-talented team of animators and illustrators and this augurs well not just for us, but the Jamaican and Caribbean animation industry.” Says Milverton Reynolds of the Development Bank of Jamaica, “[Reel Rock] is a great example of local entrepreneurs who are not only providing employment and an outlet for local creative talent, but also earning valuable foreign exchange for Jamaica.” To learn more about Reel Rock GSW, visit gswanimation.com.